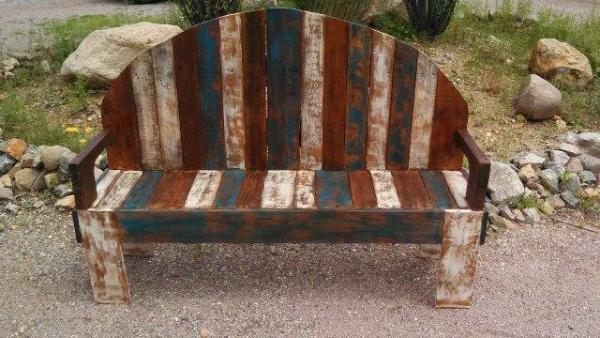 DIY ideas are really popular when it comes to the home decor and there is seen a big craze among the people to recycled the home scrap and clutter and get the most unusual and exciting home decor items out of them. 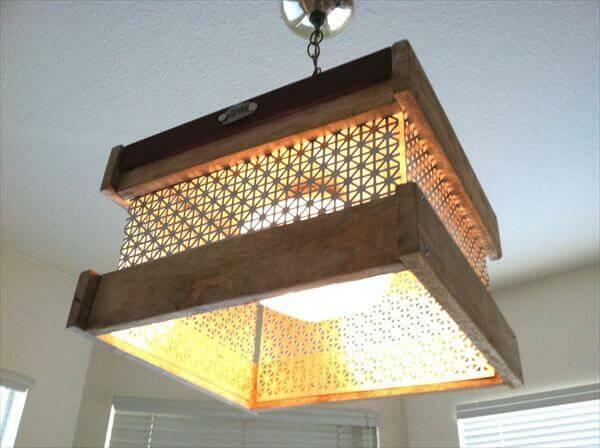 How about trying something new in this regard i mean using a different and vary material for the recycling to get some unique and rustic decor possessions you have ever witnessed? 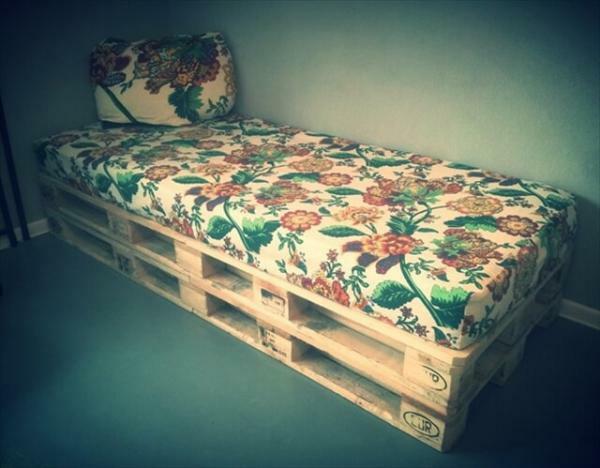 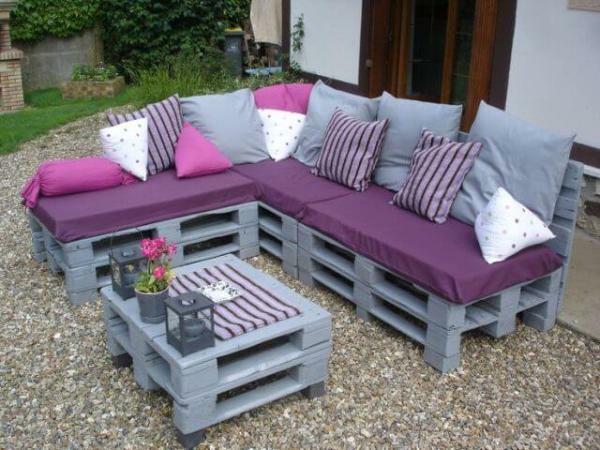 If you are willing to show some experimental enthusiasm then you are just at a right place as we would show you here some really amazing and creative pallet ideas to use pallets for your home decor which are small and cute but really refreshing and stylish too. 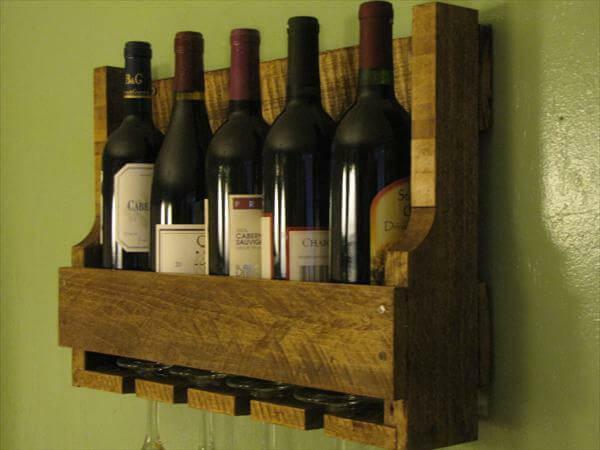 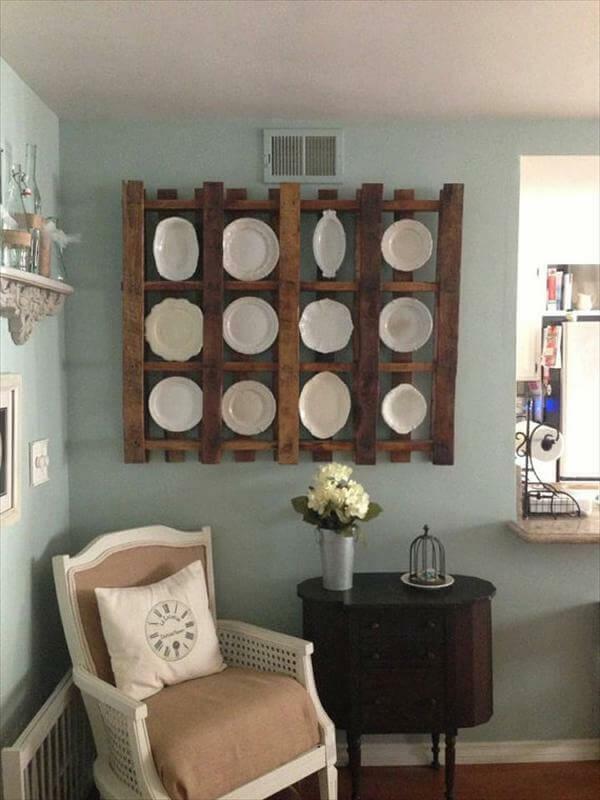 Just check out these 10 simple ans small yet functional DIY pallet ideas to juice up your home decor, a small round up that would prove to be an immense help to lend your home interiors some stand out features. 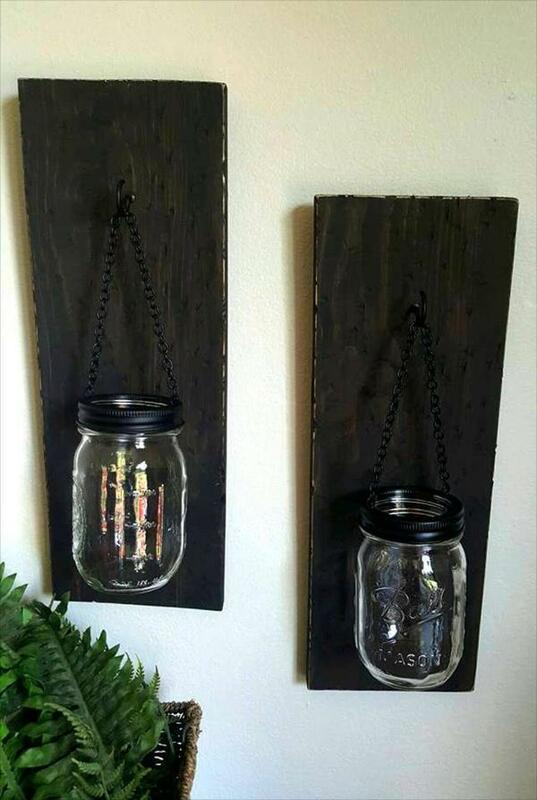 Wall art with flags, welcome signs, organizer, planters and shelves all are here to be used for the beautification of your house some of them involve the empty mason jars too so you are sure to save your money through these pallet projects. 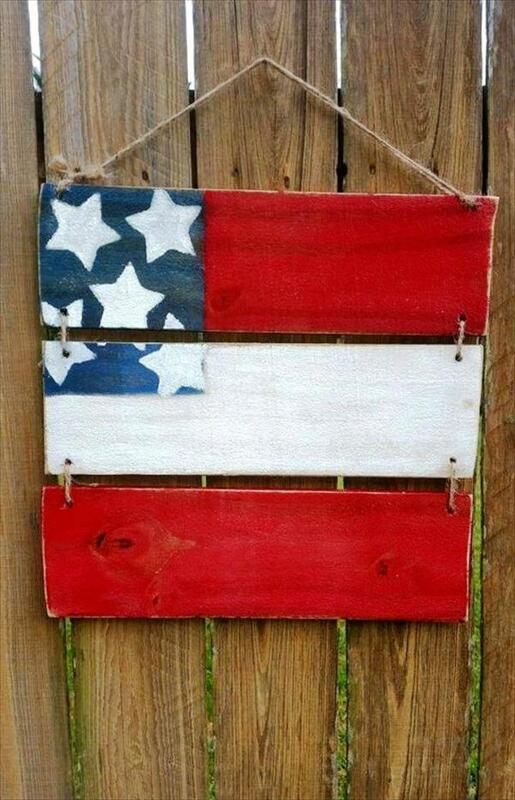 This pallet made cut and small flag art would make a very artistic and proud display on your walls and all you need is three pallet pieces and flag colors in paint and you have it ready in an hour. 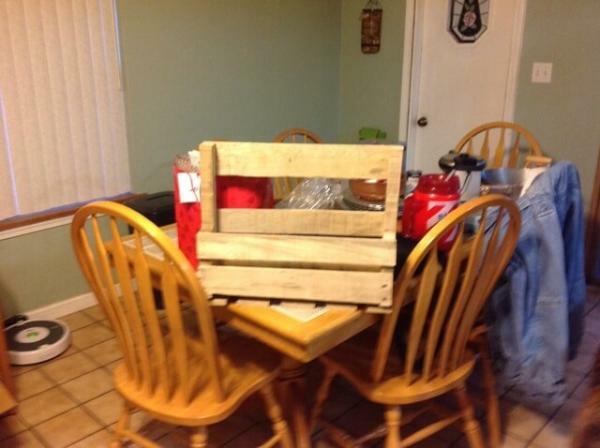 Here to get this pallet made wall organizer we have used to pallet plank pieces and two empty jars supported with chains to hold from each and every thing to any thing in them as cotton sticks, cotton balls, combs, make up etc. 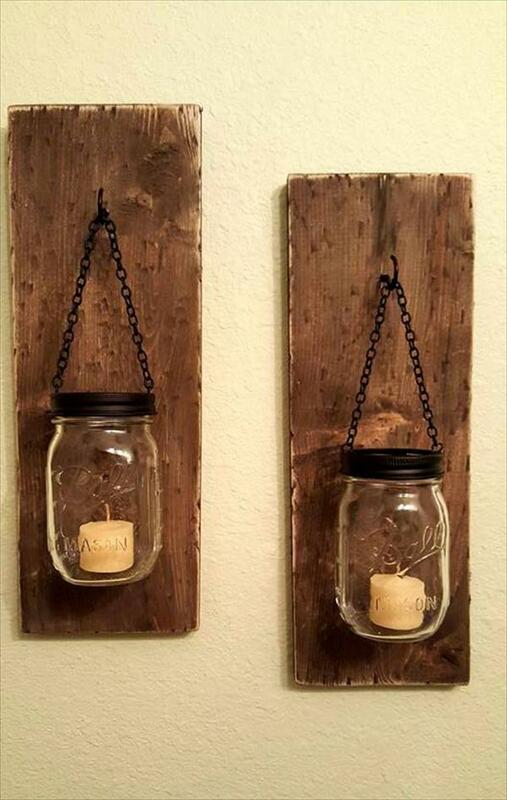 Candles can bring romantic vibes in any space with their dim and flickering light especially in the dining and living room so here you have a gorgeous and stylish way to hold your candles made out of pallets and mason jars. 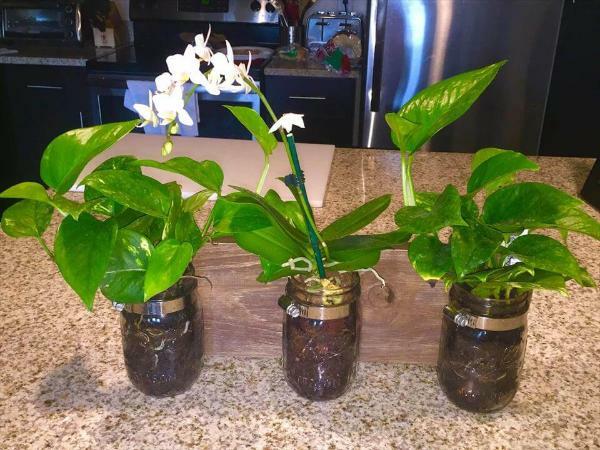 A simple pallet plank piece has been inserted with three mason jar in a row and here you get a gorgeous and cost solution to grow your favorite plants in the indoor sections of the house holding it on the tables or mounting it up on the walls. 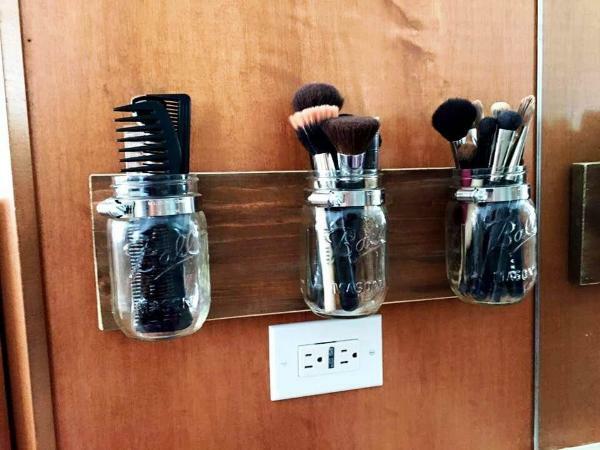 Girls know the difficulty when they can not find their eye liner brush or blending brush so here we present this amazing and cost free idea using pallets and mason jar to organize and store well all your make up brushes and combs. 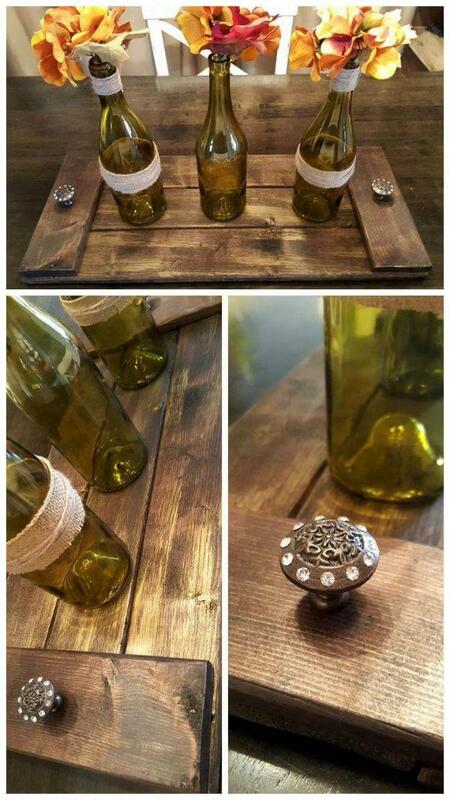 The bar bottles can be recycled to hold the plants and flower and get display on your tables or mantles and using pallets you can make this rustic but too beautiful tray to hold those decor bottles in quite an elegant way. 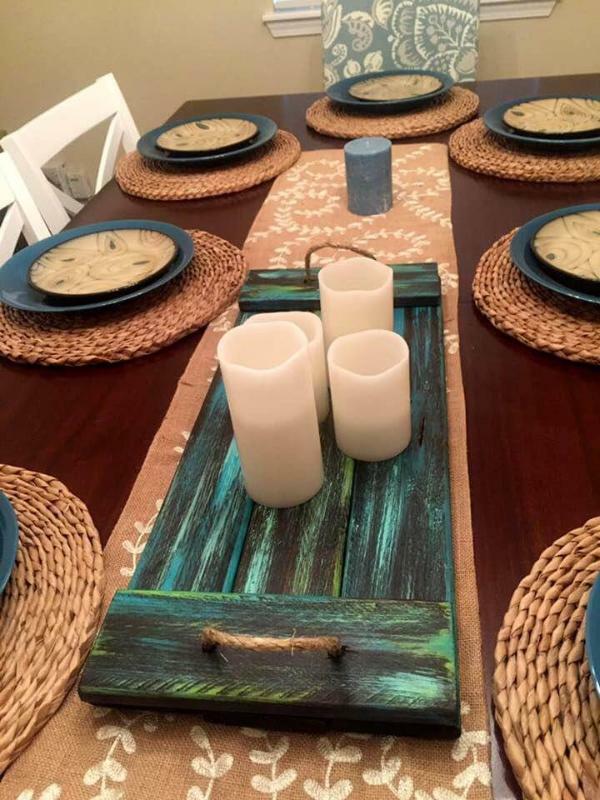 Having an eye on this pallet made tray you would recall the vintage beauty and such an awesome beauty piece has been yielded with the pallet slat pieces and top handles and can serve food or hold the candles in the middle of the dining table. 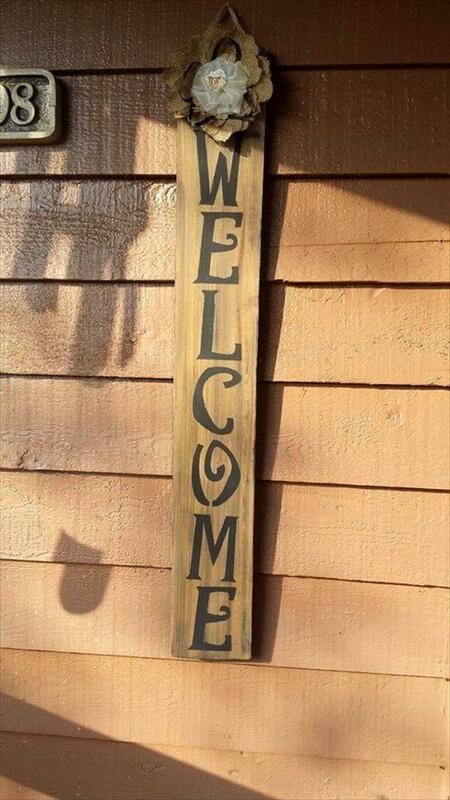 A simple and separate pallet slat piece or stripe has been decorated with a flower at the top and stenciled with word WELCOME and a gorgeous welcome sign is ready to be displayed on the doors or the main door walls. 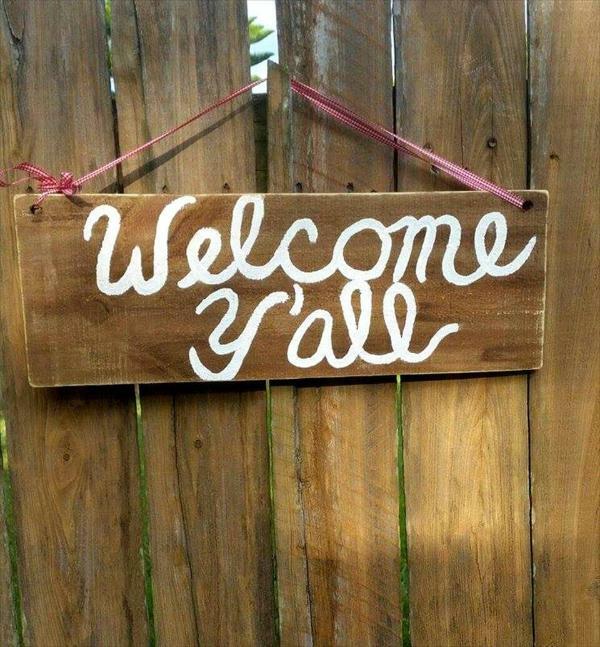 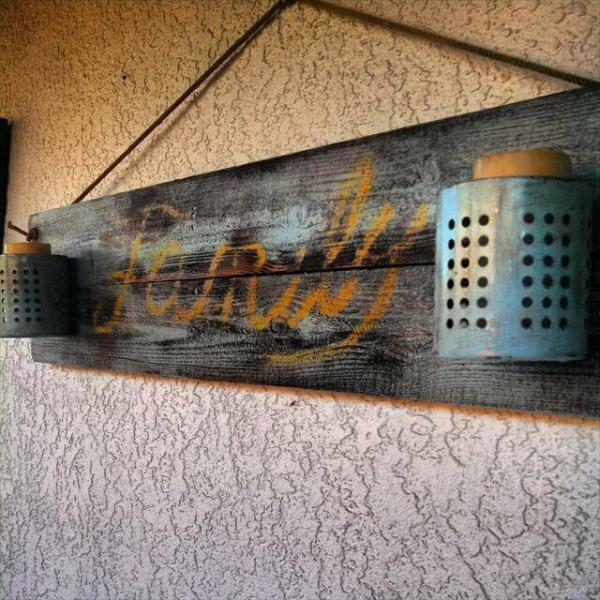 A thick and wide pallet slat piece with welcome written in white has been used as a welcome sign for the outdoor entrance to greet the guests and visitors and two drilled holes withe a rope getting through has been used to make it hang up on the wall. 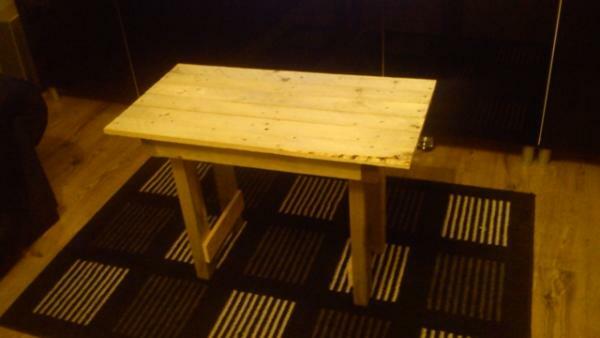 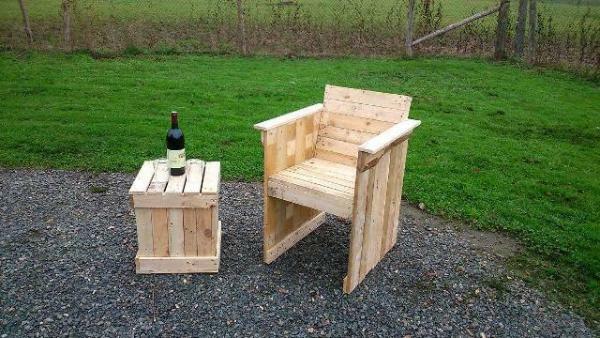 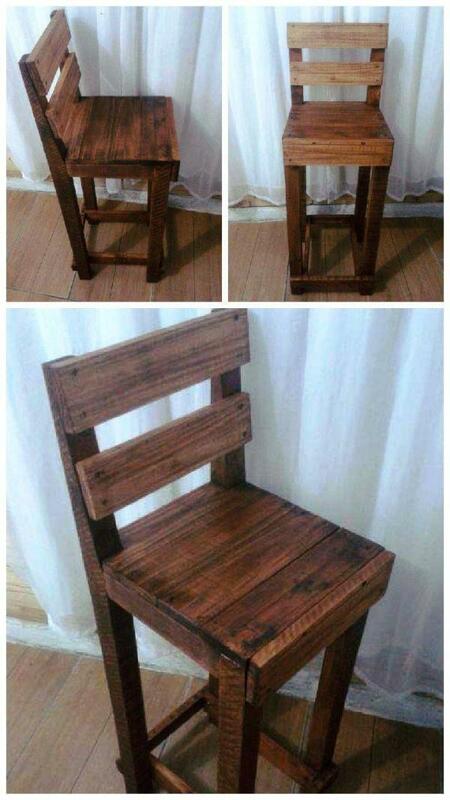 The pallet chair in this picture is a best thing you can craft for your kids out of the pallets and that too much easily only bringing in use the pallet cut slat and plank piece which have been stacked here to each other forming the back, seat and the legs with bracketed base support.